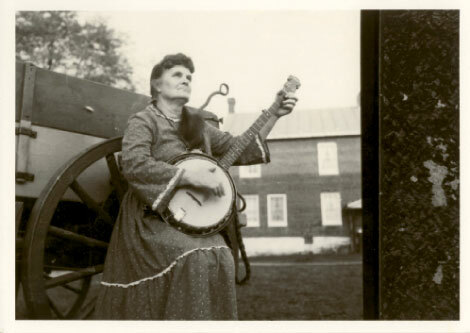 Those old enough to remember seeing Ola Belle Campbell Reed perform may recall a charismatic woman singing and playing her distinctive claw-hammer style on an old Gibson Mastertone banjo and conversing with the audience about politics, music, and mountain life. Reed lived and breathed old-time music, and left behind a legacy that still inspires new generations of string-band musicians around the world. Every August, she’s honored during the Ola Belle Reed Homecoming Festival in Lansing. The fourth of 13 children, Reed was born in a two-room cabin near Grassy Creek in Ashe County on August 17, 1916. “Some of the Campbells got the music gene and some of us didn’t,” recalls Reed’s niece, Joan Campbell. “Aunt Ola had it double.” Although she couldn’t read music, it was an integral part of her upbringing. When she was three years old, Reed began learning how to play banjo and sing traditional songs by watching and listening to her Uncle Doc, who, along with her father and grandfather, played in a regionally popular old-time band. Her family moved to Pennsylvania and later Maryland during the Depression, but the musical traditions she was raised on stayed with her. By 1936, Reed’s professional career had begun with the formation of the North Carolina Ridge Runners, a group she sang and played guitar and banjo with for more than 10 years before creating a band with her brother, Alex Campbell. The siblings formed Ola Belle and The New River Boys, which built a strong following and had their music played on more than 200 radio stations throughout the East. An invitation to perform at the White House for President Jimmy Carter’s inauguration ceremony in ’77 brought national attention. In 1986, after writing more than 40 songs and recording eight albums, Reed received the National Endowment for the Arts’ National Heritage Fellowship award. She was also honored by the Smithsonian Institute, Library of Congress, and The Country Music Association for her musical contributions. She passed away on August 16, 2002, a date around which Lansing celebrates her life the way she would have, with music. Marti was Reed’s last student and is the author of A Banjo Pickin’ Girl: The Life and Music of Ola Belle Campbell Reed.